One of my favorite things about my iPhone and iPad is the fact that I have access to an amazing collection of apps right at my fingertips. 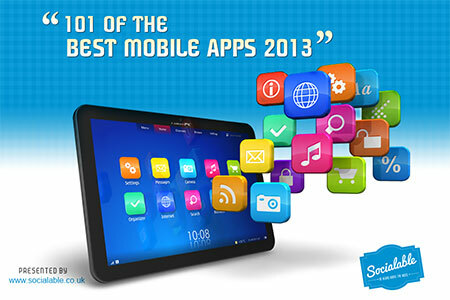 So I’ve decided that the third post in my 101 series would be about my favorite 101 smartphone and tablet apps. Many of them are also available on Android phone and tablets (* is iOS only) so there’s something for everyone. If you would like to view the different categories, click on the tags button below (the blue button) and select the category you want. Enjoy! Since Google has announced that they will stop Google Reader very soon, I had to look for some alternatives, and Feedly is my top choice! I especially love it on my iPad, as it looks exactly like a magazine, which makes reading more fun! Dropbox is one of the easiest ways to share documents with your colleagues. Dropbox syncs across all your devices, so you will be able to access your documents anywhere, anytime and share them with anyone you want. And you get 2GB free! Reddit is a great way to not only keep up to date with the most interesting news happening in the world, but it’s also the best way to have a laugh in the meantime. The Gmail official app really is the best way to access your Gmail account (or up to 5 of them if you have that many!) – it looks great, it’s easy to use and you can get push notifications. Another great app from Google, Google Drive allows you to keep all of your documents in one place, and you can upload even your biggest files here. It also allows you to share with friends, and quickly edit any of your documents. Enviar tus lecturas reales: haz una foto de tu contador o introduce la lectura manualmente. Consultar tus facturas desde tu teléfono. Controla tu gasto. Contactar directamente con HolaLuz.com para lo que necesites. HolaLuz.com es la primera comercializadora eléctrica online del mercado español. Are you looking for free brain games for kids and adults? Mastermind Board Game is an iPhone, iPad and iPod version of one of the most popular board games ever!! if you are a lover of logic games, this is the right game app for you! Challenge yourself and friends with this iOS top board game app today. It can be played as an easy entertaining pastime game or addictive brain training game. People have always been interested to challenge the mind with mind games and exercise the brain with brain training games. Our brain is a muscle and just like every other muscle it needs exercise to develop and keep fit; if you want to get some brain training and play fun brain games for kids and adults! Everybody knows (and loves) Evernote, but I couldn’t just not mention it. It’s a great fun way to keep organized, make notes and to-do lists, set reminders and jot down anything you find interesting on the web. I am a huge fan of Loyalli as it’s been making my life a lot easier. You can use it to store all of your loyalty cards on it, find loyalty offers in stores near you, as well as store opening hours and lists of prices. I’ve already gone on record saying how much I love Hootsuite, and a big part of that is the fact that they have this great smartphone app, which allows me to manage my clients’ social media (and mine) even if I am not at the computer. Flipboard is a really amazing app – simple, yet absolutely great – it’s basically a “personal news magazine” where you get all the best stories and news from the web on various subjects (that you get to pick), as well as all the latest updates from your Facebook and Twitter account. Couldn’t recommend it more! If you have any Kindle books, then this app is a must-have. If you don’t, but still enjoy reading on your smartphone/tablet, it’s still a must-have! It’s great for reading books, magazines and other types of files. Not a fan of Safari? Google’s Chrome is arguably the best browser on the web, and their mobile version leaves nothing to desire! Not a fan of your iPhone/iPad’s built-in mail app? You’re definitely not the only one! MailBox is a great alternative, although unfortunately it only works with Gmail at the moment, but they promised that new email platforms will be coming very soon! In the very near future we will probably be doing absolutely everything on our smartphones and tablets (and whatever comes next!). With SignEasy you can now sign documents directly on your smartphone/tablet, which makes it easier and easier to go completely paperless. Skype is one of my favorite ways to communicate at work and I love the fact that they have this great free smartphone app. Since I can’t always be by my desktop computer, it comes in very handy! Clear’s elegant and simple interface makes it very easy to organize your life. List-keeping has never looked so good! You’re probably wondering why I’m putting a GPS app in the ‘cool’ category, but after careful consideration I realized that’s where this app should be. What’s so great about it is that it is very social. People like you will tell you what the traffic is like, what the best routes are, where the nearest and cheapest petrol stations are, if there are any police traps on your way, and lots of other great information. One of my favorite features is that you can send a link to a friend showing you as you drive – long gone the days when you got mad at your friends for driving too fast! Until Apple sort out their Maps app, we still have to find other ways to get around town and fortunately Google launched their beloved Maps app for iOS users as well. This great app lets you add arrows and other shapes, as well as text annotations to images. And when you’re done, you can easily share it via email or Twitter, and send it to Evernote for future use. iCountTimer, a timer which counts, is an interval(counter + timer) app. The first-of-a-kind integration of timer with a counter makes iCountTimer very unique. The simple, clean and easy to use design of iCountTimer makes it a perfect app which can practically be used during workouts. In today’s fast pacing and multitasking lifestyle, you tend to miss out various occasions, events and days that could be important for you. No need to worry now! Mr. Reminder, an Android based mobile application can help you remember each and every event, meetings, days and occasions, and can also remind others, associated with you, about their important occasions! It’s that simple and useful! Mr.Silent is an Android application, offers solution to those who wish to keep their mobile phones on silent mode for specific geographical locations, time, occasions and for specific contacts. After the launch of iPhone 6 and iPhone 6 plus, apple is ready with new gifts to be distributed among its fans. Yes, you read it right! Apple would again be in limelight due to the sack of products it has got to offer. If you want to have a clear view of all your money, than this app is for you. You can view all bills and budgets in one place, across all your iOS devices.